6/19 notes & rally vid: 33.01. FAQs & Archive. The Facebook page. Online info about our senators. By Holly Brewer and Loren Bast. Please note: no meeting on the 3rd; we met for coffee instead 12.30-1.30 at the Federal Building. The next meeting with the staffers will be on the 10th. The rally vid: 30.23 & Komo news. The ACLU also had an emergency rally about the Supreme Court allowing the Muslim Ban to take effect. the vote was 5-4. The ban: NYTimes.com. There are more legal challenges coming. The countries affected by the ban. “Sen. 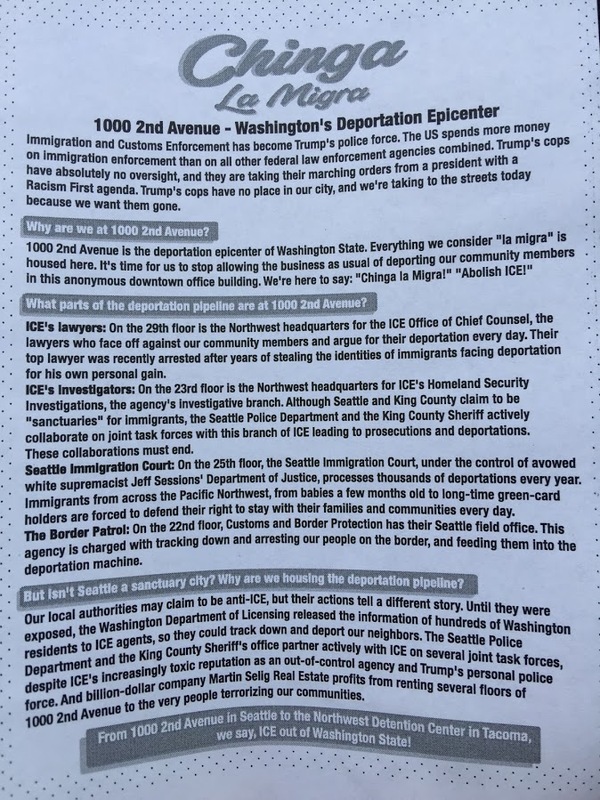 Patty Murray got campaign money from company running Tacoma center where undocumented immigrants are held”: SeattleTimes.com: “Murray’s 2016 re-election campaign received … $5,000 from the Florida-based political-action committee for The GEO Group, the nation’s largest private-prison firm,” For context, Sen. Murrray’s campaign raised $13.5m by 2016: OpenSecrets.org. About how private prisons’ stocks are faring: Observer.com. There is a firm line between the campaign arm of team Murray and Murray as a senator to prevent conflicts of interest. This means that staffers cannot talk about election issues in any way. This is from the Senate ethics committee: Ethics.Senate.gov. To comment on this, contact the campaign arm of Patty Murray’s team: the site & campmail@pattymurray.com. Sen. Murray voted for an appropriations bill that funds DHS in committee: because most of the legislation is good – and it now needs to go through markup and go to the Senate and House – and their scrutiny. The Land and Water Conservation Fund needs to be extended in September or we lose it. “Launched by Congress in 1964, the LWCF program protects open spaces and provides money for parks, trails and wildlife habitats without using tax dollars. Instead, it uses money paid by energy companies, offshore drilling royalties and natural gas leases.”: Tri-CityHerald.com. Sen. Murray is the top Democrat on the Appropriations subcommittee that funds HHS. In Appropriations, it is the Labor, Health and Human Services, Education, and Related Agencies Committee: Appropriations.Senate.gov. Ask for hearings about this immediately in the judiciary committee. Join us in Marching to Show our Disgust! Families Belong Together Rally: 6/30 Saturday 11 AM – 2 PM at Federal Detention Center, 2425 S 200th St, SeaTac, Washington 98198 – a few steps from the SeaTac train station. National action. https://www.facebook.com/events/1805746032846977/. Solidarity Day at NWDC: 7/1 Sunday 1:30 PM – 4 PM at Federal Detention Center. Regular monthly event. https://www.facebook.com/events/276798272867272/. “(Azar) told the Senate Finance Committee that if lawmakers find a legislative fix to a court ruling that bars children from being held in detention centers for longer than 20 days, then the families could be reunited immediately.”: WaPo.com. In other words, the parents are facing criminal charges for coming into the country: and their children will need to be in prison as well if the family wants to be together. This is caused by the ‘zero tolerance’ policy of this administration: PolitiFact.com. “A 2015 court order, based on a document called the Flores settlement, prevents the government from keeping migrant children in detention for more than 20 days.”: NPR.org. “The bill prohibits federal agencies from removing a child without legal immigration status from their parent or legal guardian within 100 miles of the U.S. border.”: Columbian.com … 48 Democrat senators have cosponsored the bill. Led by AG Ferguson of WA, 17 states and DC are suing to end the family separations: Independent.co.uk. 6/22/18: ‘The Trump Administration’s ‘zero-tolerance’ policy “is responsible for hundreds of children being forcibly separated from their families, falsely labeled ‘unaccompanied alien children,’ and transferred to the custody of the Department of Health and Human Services’ Office of Refugee Resettlement,” the senators wrote in a letter to Judiciary Committee Chairman Chuck Grassley. “This cruel treatment of children and families arriving to the United States demands immediate and direct Congressional oversight.”’. More: Murray.Senate.gov. 6/22/18: “HHS has … failed to provide estimates of additional funding that will likely be needed to provide adequate care for the children in its custody,” Murray said in a letter to Azar.”: RollCall.com. 5/10/18: “Congresswoman Rosa DeLauro (CT-03) and Senator Patty Murray (D-WA) sent a letter to United States Department of Health and Human Services (HHS) Secretary Alex Azar urging him to immediately fire Office of Refugee Resettlement (ORR) Director Scott Lloyd”: DeLauro.House.gov. 6/12/18: at 6.25 Sen. Murray expresses her anger about this to Azar in a hearing about prescription prices: YouTube.com. Members of Congress who have gone to detention centers bring public attention to the problem. Senator Cantwell is looking into it. Senator Murray’s staff have been. Trump’s executive order is not enough. More: CNN.com and NBCNews.com. Some other MoCs who have: Sen. Booker & Sen. Warren & Sen. Merkeley & Rep. Jayapal. Booker, Senators Introduce Bill Targeting Family Detention, Inhumane Conditions of Immigration Detention Centers, Flawed Detention Processing System: Booker.Senate.gov. Sen. Murray is a cosponsor. The vileness of the Trump administration sunk to even lower depths last week, as thousands of immigrant babies and children were separated from their families at the border between Texas and Mexico. The children were housed in converted Walmart stores, tents, and behind cages (chain-link fences) while their parents were sent to federal jails awaiting trial. These immigrants included asylum seekers, who the administration claims they are allowing to stay united; however, the ACLU has filed class-action suits claiming the contrary: ACLU.org. 6/20/18, Trump signed an executive order putting an end to the separations: but the order is likely to encounter its own challenges: Time.com. It’s unknown how quickly the separation policy will be enacted; how many families will ultimately be affected; and if families currently separated will be allowed to reunite. “Private prison lobbyists have focused on persuading Congress to maintain a federal quota that requires the detention of a certain number of immigrants at all times.”: Slate.com. ‘due to a surge in illegal border crossings and the Justice Department’s “zero-tolerance” policy — designed to discourage illegal border crossings — the agency needed to acquire access to more than 1,600 beds in Bureau of Prisons Facilities… (including) 209 beds in SeaTac;’ KomoNews.com. Nielsen, Secretary of the HHS says that toddlers being taken away from their families and handed to DHS are their problem: Twitter.com. Nielsen being mocked by resisters at a Mexican restaurant last week: Twitter.com. In May: “Kirstjen Nielsen, the homeland security secretary, told colleagues she was close to resigning after President Trump berated her on Wednesday in front of the entire cabinet for what he said was her failure to adequately secure the nation’s borders”: NYTimes.com. The most damaging thing that families can go through is when they don’t know when they will see each other: Vox.com. We need CPS to be able to arrive unannounced so that we know that the children are cared for. How do we Protest Families Being Separated? The abuse is caused by policy – even though the border guards are the ones separating families. We are reporting against the federal government. We need to contact Republican senators. People leave central America as a result of guns from the USA infiltrating their communities. An article about this: “a “straw buyer.” “I developed a group of customers,” he said … “And it dawned on me one day that they were all Hondurans; and that they all seemed to want the same type of guns; and they all seemed to want more and more.” By the time he was caught, Crumpler had resold roughly a thousand guns, including Glocks and AR-15 assault rifles. He eventually agreed to coöperate with American authorities in exchange for a two-and-a-half-year prison sentence.”: NewYorker.com. ‘The US has pulled out of the United Nations Human Rights Council, calling it a “cesspool of political bias”.’: BBC.com. With Kennedy leaving, we now need enough Congresspeople to vote for a progressive or moderate judge to fill his seat. More: NYTimes.com. Sen. Murray and Cantwell voted for the minibus appropriations bill on Monday: Senate.gov. It passed the Senate 86/5. Now the House and Senate bills need to be reconciled. It includes cleanup for Hanford; and VA caregiver program. Sen. Murray has been pushing for the caregiver program for years. Her statement about the bill passing: Murray.Senate.gov. It is in HR.6: Substance use-disorder prevention that promotes opioid recovery and treatment for patients and communities Act. A summary: EnergyCommerce.House.gov. Sen. Murray’s opioid bill is through the House (396/14): and headed to the Senate. It is one of many bills that have been consolidated into HR. 6: and it is bipartisan. “Friday, June 22, the House combined all passed opioid bills and those additional opioid bills (not yet voted on) into one package – HR 6 – and passed HR 6 (396 Yeas, 14 Nays).”: Lexology.com. The roll call: Clerk.House.gov. Sen. Murray’s and Sen. Lamar Alexander’s bipartisan Opioid Crisis Response Act was passed unanimously out of the HELP Committee and is notable for its patient/family/community-centered health focus, compared to the administration’s law enforcement approach. Sen. Murray’s statement: HELP.Senate.gov. Video of her speech in committee: YouTube.com. Committee hearing 4/24: HELP.Senate.gov. There is $3.3bn allocated for it from the omnibus bill: TheHill.com. This is not enough. The Council of Economic Advisors said that in 2015 it would take $504billion to fully solve the problem. Their Nov. 2017 report: WhiteHouse.gov. There is $100bn allocated for treatment of those with HIV / AIDS, for context. Audio of the markup of the Labor, Health and Human Services, Education, and Related Agencies Appropriations Act, 2019: Appropriations.Senate.gov. Will he privatize Veterans Affairs? We don’t know. Sen. Murray is against it. His confirmation hearing is on Wednesday. Sen. Murray has not managed to meet with him. The hearing: Veterans.Senate.gov. ‘His testimony addresses the issue of outsourcing veterans’ health care to the private sector — a priority for the Trump administration — delicately. He will tell senators that on his visits to VA hospitals as acting secretary, “I experienced what can never be duplicated in the private sector — the communal aspect of VA. What does that mean? It means that when our veterans walk into any of VA facility they converse with men and women who speak the unique language of military service.”’: WaPo.com. Sen. Murray will work hard to protect our veterans. She has a staff member specifically working on veteran’s affairs: and Washington State veterans work hard to be heard. She is the first female on the Veteran’s Committee in the Senate. Her father was a World War II veteran and a Purple Heart recipient. When he got Multiple Sclerosis and was unable to work, the VA helped them. Also, when she was at WAZU, she did an internship at the psychiatric ward of the VA and saw Vietnam vets being treated: Murray.Senate.gov. More about her work for veterans: Murray.Senate.gov. She is on the Military Construction, Veterans Affairs, and Related Agencies subcommittee and the Veteran’s Affairs Committee. How do the Parties Speak to each Other? They find common ground. “in November 2012, Senator Patty Murray asked her House counterpart, Paul Ryan, to meet for breakfast in the Senate Dining Room. It was a bit like an awkward first date. … For Ryan, sports became their very language”: Elle.com. There is bipartisan legislation. Not everything is polarizing: the opioid bill, for example. 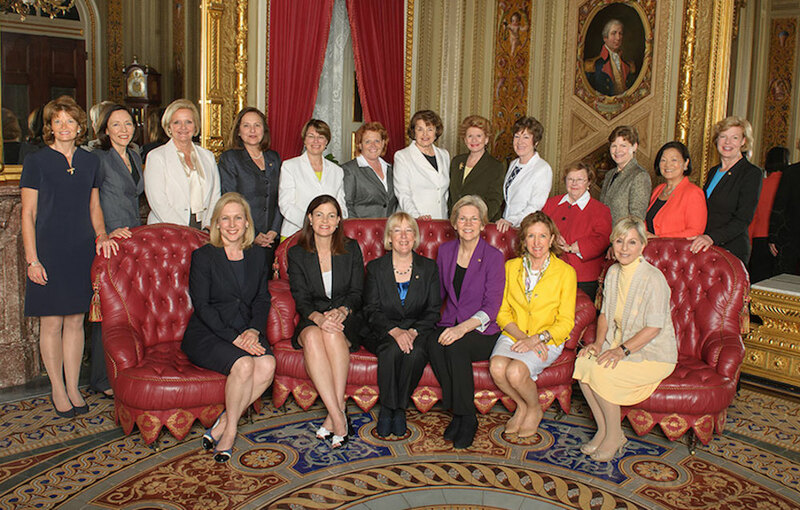 Also, Sen. Murray frequently works with other female senators. Members of Congress do talk about the detention crisis and other issues. This administration is closing parks, polluting and hurting people: and all the rest. Our senators cannot influence the press, of course: but to promote awareness, they can write op-eds like this: From Sen. Murray in USA Today: “Republicans tried again and again over the past year to pass bills that would raise health care costs, leave millions fewer covered, and gut protections for women, seniors, and people with pre-existing conditions. They raised 2018 premiums by injecting uncertainty into health care markets and by intentionally making it harder for people to learn about coverage options and enroll.”: USAToday.com. Sen. Murray has a Medium page: Medium.com. 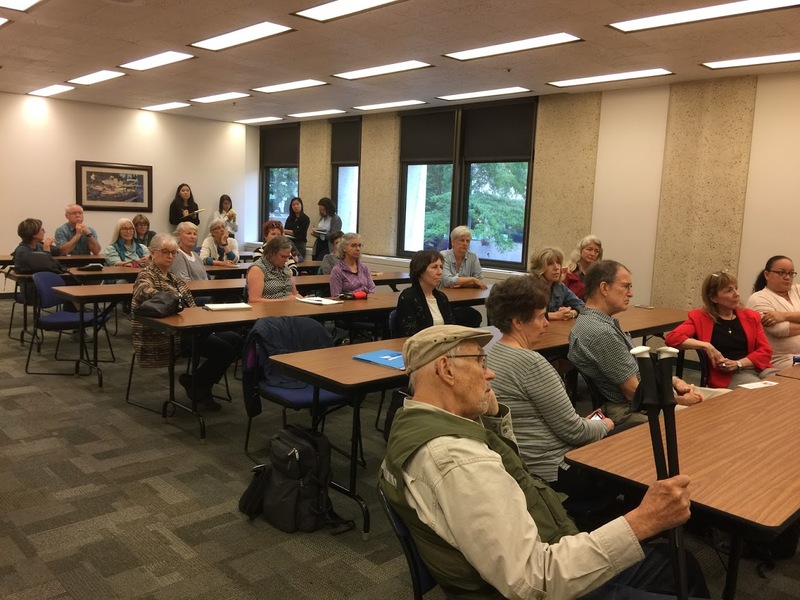 Sen. Murray’s staffer, Kate works with constituents in the Seattle area. She has colleagues in the senator’s office – as does Tommy – throughout the state. They all report that there are problems that result from tariffs being placed on agricultural products that we want to export; and that we need help in harvesting to get the products to market. Information about agricultural products from here: NetState.com. ‘“Mr. Secretary, I want you to hear me. Apples and cherries are getting hurt,” Senator Cantwell said. “Now, seafood, which again is also on short margin, is going to be in the same spot…. [W]hen we have trade wars it impacts the Washington economy in a major way.”’: KPQ.com. About the Temporary Agricultural Workers program: USCIS.gov. This is a bipartisan issue: because it affects every state. Sen. Cantwell spoke with Azar on Tuesday about prescription costs – and how we can bargain them down. He is all about choices through a ‘competitive marketplace’ (through private for-profit companies) as opposed to ‘national price fixing’. Sen. Cantwell starts at 1:25:45: C-Span.org. About Sen. Cantwell’s basic health care plan: PDF. We want our senators to call out propaganda sent to our personal emails. Yes, those of us who receive the emails signed up: the point is that this is being broadcast and we need to call it out. “The lion’s share of the farm bill’s funding is devoted to programs such as food stamps, or the Supplemental Nutrition Assistance Program. Total benefits paid out last year by SNAP exceeded $63 billion and went to more than 42 million participants. The House Farm Bill cuts the funding for SNAP by 30 per cent. More: WaPo.com. They have to pass the Farm bill this legislative session before they do rescissions. There are limited days left this session. Senate’s proposed calendar: Senate.gov. One of the anticipated legislative priorities in the House for the Spring session is the Farm Bill, which goes up for renewal every 5 years. It is due by September 30th. For more information about the Farm Bill and its history, see FRAC.org. The SNAP Program is within the Farm Bill. Trump wants to strip away due process for undocumented immigrants: YouTube.com. Sen. Cantwell was caustic in this video about a rider on a water bill: Youtube.com. She nailed down on Zuckerberg recently: RealClearPloitics.com. 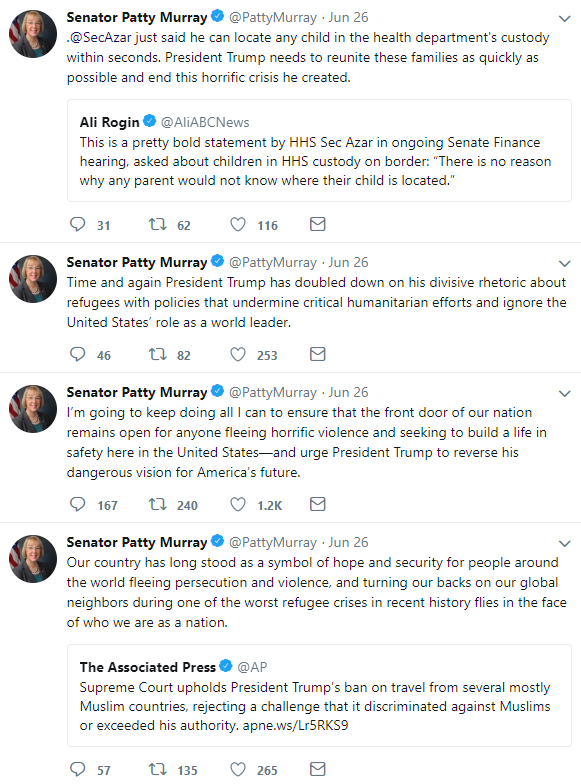 Senator Murray on President Trump’s Executive Order on Family Separation Policy: “It’s not enough. We are not going to say everything is OK, and we are not going to stay quiet”: Murray.Senate.gov. 6, 000 people called and emailed Sen. Murray’s office last week about family separations. Very few were for family separation. People never call or email to support policy. They always contact senators to complain. When people who believe in human rights protest people who are speaking propaganda and lies – like Sarah Huckabee Sanders, they are seen as unfair. Whereas the same people think that Trump telling people to beat people up is okay. Michelle Goldberg’s opinion piece about this: NYTimes.com. This is what Maxine Waters said: ‘”Let’s make sure we show up wherever we have to show up,” the California Democrat said. “And if you see anybody from that Cabinet in a restaurant, in a department store, at a gasoline station, you get out and you create a crowd. “And you push back on them. And you tell them they’re not welcome anymore, anywhere. We’ve got to get the children connected to their parents.”‘: ChicagoTribune.com. Are our senators afraid of the political situation? Yes. We need to canvass in red districts and flip them back to get control. Have a party and write postcards to remind people to vote: https://postcardstovoters.org/, or to text people to remind them to vote: TextTheVote.com. The vote on rates for student loans is in July. The rates now are almost 6 percent. Both senators have voted to lower rates and allow refinancing.